The Jyväskylä Educational Consortium (JEC) is a provider of high-quality general and vocational upper secondary education and training for altogether 8 000 youth and 13 000 adult students every year. The Information and Telecommunications Technology department and Electrical Engineering and Automation department were in need for a new laboratory for practical training. The laboratory should be suitable for many uses including youth education, adult education, theory lessons and practical training in electrical engineering and electronics. Furthermore, the laboratory should be suitable for applied exercises in ICT technologies. 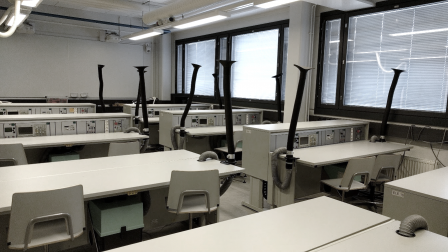 The laboratory was equipped with TEKLAB Help5 multipurpose training benches. Help5 benches are equipped with motorized instrument panel which can be driven down for theory lessons. Help5 workbenches included suitable instruments for electrical and electronics studies such as power supplies, function generators, oscilloscopes and data connections. Fume extractors were added to remove and filter harmful soldering gases.